Tired of converting your video files to MP4 to watch them on your iOS device? With OPlayer, there is no need to convert at all. If you’re tired of downloading shady MP4 converters or paying for premium conversion applications, just to watch your videos on your iOS device, than it’s time to move onto bigger and better things. 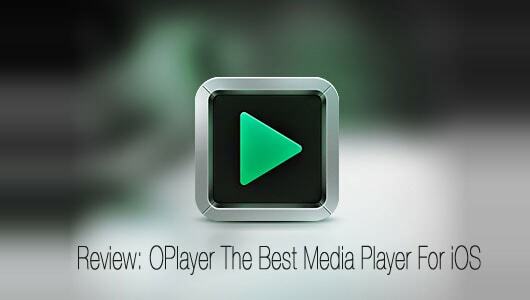 A app developed by Olimsoft called OPlayer allows you to watch and listen to videos and music of almost any format. It doesn’t just allow you to use formats other than MP4 either, this is by far one of the most robust media players I’ve ever seen, especially for a mobile app. What makes this iOS app so great? We’re going to dive in and let you know exactly why, in this review for what most call, the greatest media player on iOS, OPlayer. It really doesn’t feel like that long ago. that Apple had iOS almost completely on lock down. You may remember back when Apple had rejected 3rd party browsers because Safari was built into the operating system, at the time they really didn’t care how low of a performance rating Safari had, you were going to use it. The scenario played out for many apps that were rejected on the App Store, especially ones that provided support to play none MP4 formats on your device. To be honest, I used to be as anti-Apple as you could possibly get for reasons just like this, but thankfully Apple has started to change their tune regarding strict lock down policies on the App Store. OPlayer is one of the best examples of how much better your iOS experience can be when Apple allows apps to utilize more formats. iPhones, iPod touch, and iPad have always been restricted to a very specific MP4 format, even if your MP4 file had a slight difference in the audio sampling rate than what Apple required, the file would not work on the device. So now being able to simply drag and drop almost any video or audio format into your device and start using it feels like a gift from on high. OPlayer supports a wide range of formats including AVI, WMA, MP3, RM, AAC, WMV, MP4, XVID, RMVB, MOV, 3GP, MPG, WAV, TS, MKV, OGG, and let’s just say plenty more. It also supports most subtitle formats like SUB, SRT, SMI, and even TXT. Chances are, if you have a media file that plays on your computer, it will most likely work on OPlayer. Not only will it play just about any media format, but it plays it with the with perfect desktop quality and speed. You’re able to jump to any point in the video or song quickly without much hesitation at all. The app itself is also wonderfully designed, there are two versions of OPlayer available on the App Store, the standard version and the HD version. 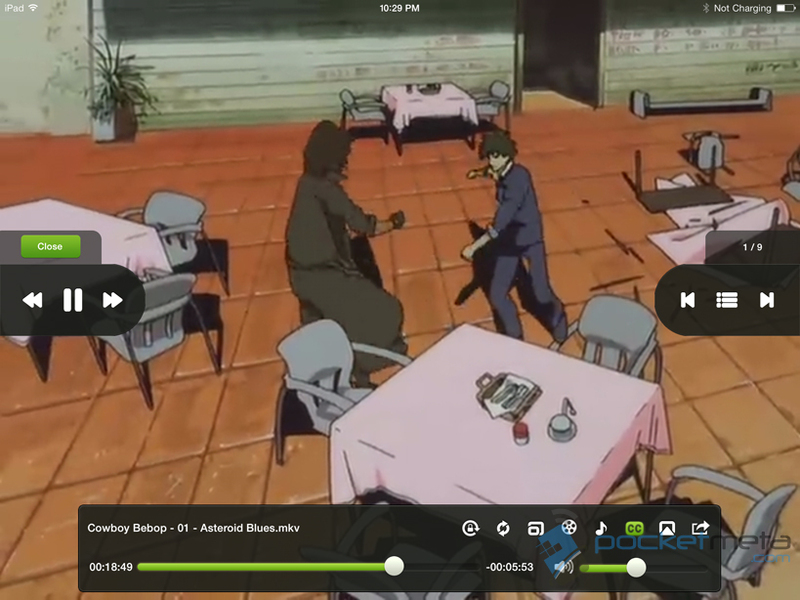 The HD version is about $2 more than the standard, but if you’re using it on a iPad it’s well worth the extra dollars. That’s not to say the standard version is bad on a iPad, but it works like any iPhone or iPod Touch app, so you’ll be working with a zoom mode versus the standard iPad resolution. Other than the resolution, both versions of the app work exactly the same. When first opening the app, you’re pleasantly greeted with a well organized and clean look interface. On your left side you’ll have a docking bar that has several features like playlists, downloads, and even a web browser. The dock always stays to the side when you’re not playing any media, making it extremely quick and easy to navigate around the app no matter what you’re doing in it. The File browser is the main option that lists all of your media. This is where OPlayer really strives to impress, you’ll have your local folder, which is all the media saved directly to the device, your iPod Library, a remote URL section that lets you connect to any website that hosts supported media, and what’s most impressive is that you can even connect directly to a computer on your network using FTP/Samba server. If you’re not sure how to setup a Samba/FTP server, Olimsoft is gracious enough to have a guide on their website, which you can access here. Having access to your home computer or a FTP site through the Auto Discovery is one of the greatest features that any mobile media player can have. This means that if you’re sporting a little 8GB phone like myself, you don’t have to fill up your device with media, you can just stream it directly to the player. The Open URL function also works great with sites like Google Docs, Dropbox, and any site that hosts media formats. This is also where having a browser built into the app comes in very handy, you quickly navigate to the browser, log into your Dropbox account and select files to stream right from the browser. There is also a a option to browse your iTunes media just like you would in iTunes or the built-in music player. You’ll find plenty of options and settings in OPlayer as well. By default iTunes will not backup your media, but you can enable a media backup within the OPlayer app, you can also use FTP, Samba, WiFi Upload, and of course iTunes to move media to and from your device. OPlayer offers additional themes and a Photo Viewer addin as additional in-app purchases. Of course, you’ll also find all the options you’d need when using and managing media. You can set screen lock timers, resume function that prevents the app or device closing, supports loop one or loop all, as well as giving you options to turn subtitles on or off. The file browser makes managing your media simple by allowing you to cut, copy, and paste your files from within the app itself. There’s no question that the developers at Olimsoft really care about this application, the amount of effort that they put into making this such a functional and versatile media player blows away that of many iOS developers now days. Making sure that the you have the best media player possible isn’t the only thing Olimsoft strives for, they also want you to know how to use every aspect of it. They have several guides that you can access within OPlayer and loads of information on their blog, which you can access here. It’s easy to tell that the developers work hard to help out every user they can, as you have the ability to submit questions and comments directly to their blog. You don’t have to use all of the additional features and options within OPlayer to consider this a great app, but the fact that they’re in the application at all scores some major points in our book. I can’t understand why Apple hasn’t integrated the app directly into the OS by now, but with all the functionality and the smooth playback this app is not only worth every penny, but it’s one hell of a bargain too. You can purchase the standard OPlayer for $2.99 or the HD version for $4.99, if you’re not using a iPad the standard version will work just fine for you, otherwise make sure and get the HD version. As always, let us know what you think in the comment below. You can also like our Facebook page, follow us on Twitter, and add us to your circles in Google+ to keep yourself up to date on all things mobile.